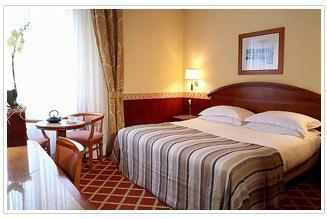 Hotel Starhotels Michelangelo Firenze, Florence. Starhotels Michelangelo Firenze Hotel Florence. Starhotels Michelangelo is an elegant hotel with outstanding services, perfect for any kind of travel, from a business stay or a holiday organized to sightsee Florence. Starhotels Michelangelo is set in the heart of Florence, near Ponte Vecchio and the Fortezza da Basso, next to the main artistic sites. We invite you to taste our Tuscan specialities in our restaurant that offers a rich menu enriched by international courses. The hotel rooms, equipped with a traditional but functional style, offer the best amenities and we guarantee your stay will be relaxing and enjoyable. The hotel offers 7 meeting rooms able to host as many as 230 people. Our guests can find Fitness Room, available 24h, complimentary shuttle service from/to Santa Maria Novella station and a bar, perfect to spend pleasant moments sipping a cockatil or tasting a quick light meals.